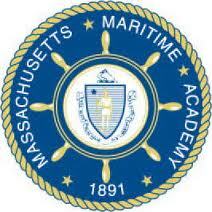 Located on Cape Cod, at the mouth of the scenic Cape Cod Canal, Massachusetts Maritime Academy is the ideal college to pursue your love for the ocean, your concern for the environment, your interest in Math and Sciences, and your thirst for adventure. As part of your training you will travel to exotic foreign ports aboard our new training ship Kennedy -- a 15,500 horsepower, 540 foot steamship -- which you and your fellow cadets will actually control under the close supervision of seasoned professionals. Our graduates have been at the very top of seagoing, engineering, and environmental professions. Additionally, many of our graduates have translated their educational experiences and personal traits developed at MMA into rewarding careers ashore. Whether in engineering, business. government, environmental protection, marine science, military, law, medicine, management, education or many other professions, the lessons you learn at the Academy will prepare you for success.